The Pentecost account in Acts chapter two shows how open and inclusive God is. So often, we want to define faith and community in a small way as our church or our denomination – or if we are being very ecumenical, we might just say all Christians. However, look and see how wide open God throws those doors. All people within hearing range heard and understand what was being said. This passage reminds me of the American Bible Society that seeks out people to translate the Bible into a variety of languages so that people can read these spiritual texts in their own languages.. This move to translate sacred texts began in the Reformation with Martin Luther believing that people need access to the scriptures in a way they can understand. What an amazing gift it is to have scriptures that we can read and study so that we can learn from the best spiritual teachers down through history. However, even with that gift, how many Bibles sit dusty on the shelf? And, we need to remember that having the Bible in German did not prevent the Nazis from taking over the church during WWII. Some people can read and not understand the meaning behind the words. Having the scriptures available and even reading them is not enough. We also need the Spirit to indwell us. The simple prayer asking Jesus to live in our heart asks the Spirit in, into our heart and into our life. Once in, God can transform us into people who will enrich this world. This morning, I opened an email with a link to a video of a man singing in the middle of the street. He sang “You Raise Me Up.” It is absolutely beautiful and made me think of Pentecost and our celebration of the Holy Spirit. Each person has gifts and talents that can be used for the common good to make the world a better place. There are many gifts. With friends and with God’s help, you can develop them to make this world a better place. Enjoy the beautiful music as long as the link exists. In searching my archives for a picture for God’s inclusivity, I found this photo of three international students playing in one of our local churches. 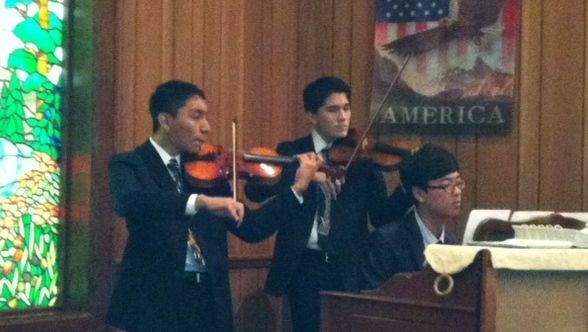 They are from Mexico, Korea, and Guatemala and playing in a south Texas church. What a source of inspiration & encouragement they were to the congregation who responded with an excellent meal. The food was well received. This entry was posted in Hope, Living Fully, Love, Wholeness and tagged Christian, faith, God, grace, hope, Inclusiveness, love, wholeness. Bookmark the permalink. Well said, Sonja. And oh, he music is beautiful. Thank you. Mary Ann, I am so glad that you enjoyed the music – as did I.